Hundreds of people have taken part in a “Ring of Peace” action held in the center of the Swedish capital to protest against racism, xenophobia, and anti-Semitism. 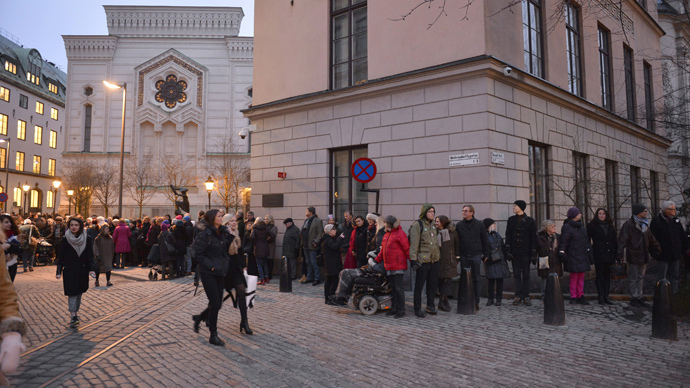 The event was inspired by a similar vigil in Oslo last Saturday. "This is the real Sweden," Swedish Prime Minister Stefan Löfven told Swedish Radio News as he took part in the action Friday afternoon. People took each other’s hands and formed a human chain around the Stockholm synagouge. The event was organized by several activist groups, including Young Muslims Against Anti-Semitism and Xenophobia and Young Roma. According to Emir Selimi, chairman of Young Roma, the project is about understanding, love, and trust. “I think it's really important for us to show that even if we see a lot of hatred in the world, we are all just people," Selimi said. Another action took place in neighboring Denmark, where hundreds of people also formed a human chain in City Hall Square. “A mad man must not succeed in creating a rift," Frank Jensen, the mayor of the Danish capital, told AP. The solidarity actions follow a vigil in Oslo, Norway that took place last Saturday. Over 1,000 people took part in the rally of solidarity following increased anti-Semitism in Europe, including a fatal shooting in Denmark on February 14. Violence against Jews has been in the spotlight since attacks in Paris in January, when Islamists first assaulted the offices of satirical magazine Charlie Hebdo and then took hostages in a kosher shop. In February, a gunman also launched an attack at a free speech event in Copenhagen, killing two people. A Jewish guard at a synagogue in the city was killed just hours later. The spate of attacks has prompted Israeli Prime Minister Benjamin Netanyahu to urge European Jews to immigrate to Israel if they feel unsafe.